Confession Time: I’m a creature of habit, by choice. I love my routines. I enjoy following a schedule and feel very accomplished when I get to check daily tasks off of my To-Do List. It makes me feel efficient and organized. And when I’m organized, I feel like I’ve got everything under control. I’m on top of the world. When I decided to start planning my PCT thru-hike last year, the first thing I did was create a PCT To-Do List. From there, I would check tasks off the list as I completed them. Read Yogi’s Pacific Crest Trail Handbook? Check! Pick a start date? Check! Apply for a PCT Long Distance Permit, California Campfire Permit and Application to Enter Canada via the PCT? Check! Check! Check! Pick a water filter and learn how to use it? Check! Go on at least one hike a week? Check! Put together a town stop itinerary for my entire trip before the new year? Check! Then came the harder tasks to check off the list like making more time in my schedule to hike multiple times a week. I couldn’t do this with a 40+ hour/week, Monday through Friday day job. I needed more flexibility in my week to get my training in. Hiking only on Saturdays and Sundays wasn’t going to cut it. My first step to getting out of my comfort zone was to give up the day job. I went back to bartending and upped the amount of yoga classes I taught each week. At first, leaving a comfortable, financially stable day job was pretty scary. Would I make enough money to pay my bills and save for my trip? Would my new schedule allow me the additional time I wanted to devote to training hikes? Turns out that was a big fat yes and yes. Check and Check! Then there was being okay with being by myself out in the wilderness. Since I was planning to hike the PCT solo, I had to start getting used to hiking without the comfort of having my friends around. At first, going on solo hikes was probably one of the scariest things I’ve ever done. Could I really hike out there all by myself? What if I fall and hurt myself? Who would call for help? What if I get lost? What happens if I run into a creepy person or a bear on the trail? Putting all the “What If’s” aside, I went on a hike by myself. I started off on popular, well-traveled trails because I knew there would be other people. Then something magical happened. After a couple of solo hikes, I started craving getting out there by myself. I wondered why I hadn’t tried solo hiking sooner? I stepped even further out of my comfort zone and started choosing less popular trails, in hopes of not seeing another soul on the trail for miles. Getting used to being okay with being by myself in the wilderness? Check! This week, the theme for my yoga classes is to get out of your comfort zone. I’m encouraging my students to try something new, either in their yoga practice or outside of the studio. I’m encouraging them to make a change, even if it’s a small change. I’m asking students to think about their limits, their edge, and find a way to safely move beyond it. For example, on the mat it could be exploring a new option in a posture or holding a posture a little longer than they normally would. When it comes to getting out of your comfort zone, acknowledge whatever it is you’re afraid of and embrace the discomfort of trying something new. When we’re able to overcome our own limitations, doors will open to more challenges we can achieve. If we don’t challenge ourselves to getting out of our comfort zone every now and then, Robin Sharma says, “The fears we don’t face become our limits.” Who wants to spend the rest of their life living in a bubble? 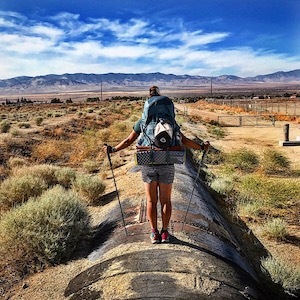 Even though I teach yoga to hundreds of people each week and am planning a five month thru-hike along the Pacific Crest Trail, I’m scared getting out of my comfort zone too. In less than a month, I’ll be hopping on a plane to fly to San Diego to hike the PCT by myself, all 2,650+ miles of it. I have a lot of fears about this upcoming adventure – the fear of being along in the wilderness, the fear of sleeping alone in my tent in the middle of nowhere, the fear of being hungry, being thirsty, being cold, extreme weather and possible injury. All of these fears aside, I’m ready to embrace the discomfort of trying something new, to get out of my comfort zone, no matter how scary it all may seem right now. « Only 39 Days Until I Start Hiking the PCT!